HOT Deals on Iams Dog & Cat Food after $3 Coupon at Amazon! Amazon is offering a number of HOT deals on Iams Dog & Cat food when you use the $3 coupon found on the product pages! Shipping is Free with Prime or on orders of $25 or more! Iams Premium Protection Kitten, 2.2-Pound Bags (Pack of 4) – just $6.23 (reg. $26) after $3 coupon. 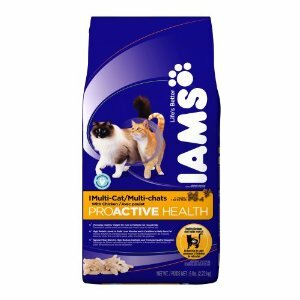 Iams Proactive Health Adult Multi-Cat with Chicken,6-Pound Bags – just $7.71 (reg. $14.34) after $3 off coupon! Iams Proactive Health Adult Multi-Cat with Chicken and Salmon, 6-Pound Bags – just $7.95 (reg. $14.34) after $3 off coupon! Iams Healthy Naturals Adult Cat Weight Control, 6-Pound Bags – just $8.49 (reg. $14.45) after $3 coupon. Iams Health Naturals Adult Cat with Wholesome, Natural Chicken, 1.8-Pound Bags (Pack of 4) – just $12.78 (reg. $20) after $3 coupon. Iams Premium Protection Puppy, 6.3-Pound Bags (Pack of 2) – just $7 (reg. $26) after $3 coupon. Iams Proactive Health Adult Chunks, 17.5-Pound Bags – just $14.52 (reg. $24) after $3 coupon. Iams Proactive Health Adult Large Breed Dog Food, 17.5-Pound Bags – just $12.31 (reg. $22) after $3 coupon. Iams Proactive Health Puppy Small and Toy Breed, 3.5-Pound Bags (Pack of 5) – $12.90 (reg. $34) after $3 coupon. Iams Proactive Health Adult Active Maturity, 17.5-Pound Bags – just $14.88 (reg. $22) after $3 coupon. ProActive Health Adult Dog MiniChunks, 17.5-pound – $14.88 (reg. $22) after $3 coupon. Iams Proactive Health Adult Weight Control, 3.5-Pound Bags (Pack of 5) – $19.04 (eg. $33) after $3 coupon. Check out MORE Iams Deals here! ProFlowers: $30 Gift Certificate for $15! FREE 8×10 Collage Print from Walgreens!